Registration may be open to all, or it may require knowledge of an "Access code" - a word or phrase which must be entered in order to succeed in registration. Access codes are useful if you need to allow a large group of individuals to be given membership of a usergroup, but don't want to set them up individually. By simply bulk emailing them with the url to go to to register, and the Access Code to quote, they can register themselves with the system, and invent their own passwords. In the above example the Access Codes dialog has been opened by right-clicking on the 'Registered Visitor' user-group (highlighted) to create an access code in order to allow members of the 'Visitor' (open access) to register on the website. 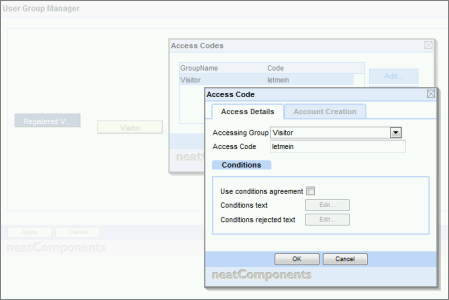 The access code has just been set by selecting 'Add', and the dialog above shows the dialog in 'Edit' view, ready to change the code.